London: Parliament House (designs for). 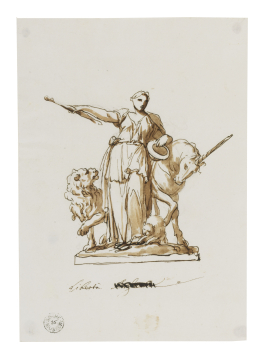 Sketch design for a sculptural group on a plinth showing a standing female figure with a sceptre in one hand and probably a crown in the other, leaning on a unicorn, with a lion on the other side and a cat at her feet. You are here: CollectionsOnline / London: Parliament House (designs for). Sketch design for a sculptural group on a plinth showing a standing female figure with a sceptre in one hand and probably a crown in the other, leaning on a unicorn, with a lion on the other side and a cat at her feet. This drawing is the companion to Adam vol.7/34, and the pen inscription in Italian is probably in Antonio Zucchi's hand. The figure of 'Liberty' is a standing version of the seated figure in Adam vol.7/34.